Sharon Santoni is well known by Francophiles who either read her daily blog, My French Country Home, or subscribe to her Stylish French Box to receive their quarterly box of French goodies. Growing up in England but married to a Frenchman, she raised her family in Normandy and writes enchantingly about rural French living, the ups and downs of family life, her inspiring French girlfriends, the intricacies of village life and her love of searching for brocante treasures in the flea markets of Paris and the countryside. In French, entertaining is translated as l’art recevoir, or “the art of receiving,” and is a part of everyday living. Elevating this to an art is a speciality of the French and goes beyond merely cooking, selecting the right flowers, setting a dramatic tablescape and opening fine wines. The French take great pleasure in doing this with simple yet inspired grace and style. Santoni divides her book into four chapters: Spring, Summer, Autumn, and Winter and regales us with stories, her gardens and magical recipes to sync with the seasons. Her personal tales evoke the spirit of the true French lifestyle as she creates lush bouquets from her garden and utilizes resources from surrounding nature and sets gorgeous tables both indoors and outdoors. Venues range from a Sunday morning breakfast on the patio, to a ladies lunch in her lush garden, a formal dinner in her dining room, and a picnic by the river. Santoni also shares 15 favorite recipes utilizing seasonal foods. She is always guided by the seasons and how they dictate us to feel, dress, and eat. One can almost feel the crackling fires in her old Normandy stone house, imagine her pruning the wisteria on a cold Spring morning, then preparing to welcome guests with a hearty breakfast of hot coffee and red fruits tarts on the terrace. Lunch in the garden is often served on plates decorated with sprigs of flowers pulled moments before and with monogrammed napkins bought over the years at antique fairs. With this book in hand we gain an insight into just how demanding life in the countryside might be. But for Santoni it is all pure delight as she harvests her herbs and prepares her culinary treasures while linens are left to dry in the sun. As Spring gives way to Summer, June, roses and last-minute invitations are the order of the day withy salads, and small amuse-bouches, each day one to savor, storing energy for the autumn ahead. Be it a picnic by the river, a quiche Lorraine, or a strawberry tarte, we to go along with the author and marvel at her tables, gardens and flowers. Autumn is a comfort zone, a time to relax in between picking apples and pears—a happy, fragrant season to be relished. We are given the recipe for a delicious tradition tarte tatin, see a table loaded with cheese set in the forest, savor pumpkin soup. And go mushroom foraging. There are cozy dinners, fireside cooking, and marketing tips. Winter and the holidays send Santoni into sparkling overdrive with quiet dinners, and Christmas then New Year’s galas. Her roast duck with quince and root vegetables looks to die for. And her Buche de Noel, well, magnifique. This is not a cookbook per se, but a celebration of life in the French countryside enhanced by stunning photography that made us feel right at home. Short of a trip to Normandy, this book will take you to the heart of France; you can almost smell the lemon tarts and chocolate mousse. But it takes no effort at all to absorb Sharon Santoni’s zest for life and living and making things special by opening her house and heart, her culinary skills, pets and family to her friends . . . and to us. 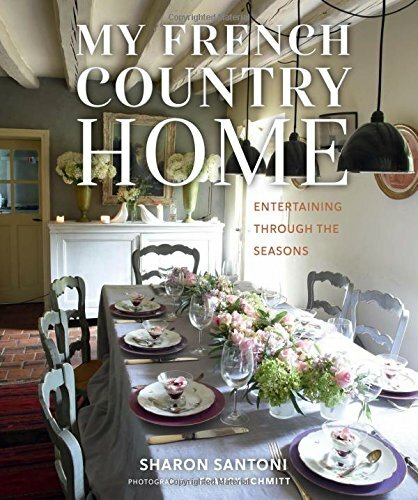 Sharon Santoni reveals herself to be every-gracious, effortlessly guiding us through the French way of dazzling guests at her beautiful countryside home 365 days a year.